People enjoy the warmth of late fall while chatting things over with local friends and acquaintances at Qianmen East Hutong Alley in November of the year 2003 which turned out to be the last fall that the Qianmen Hutong could be enjoyed and explored in their complete and nearly untouched state. The next year demolition would start a drastic alteration of the local landscape and the partial destruction of the alley itself. 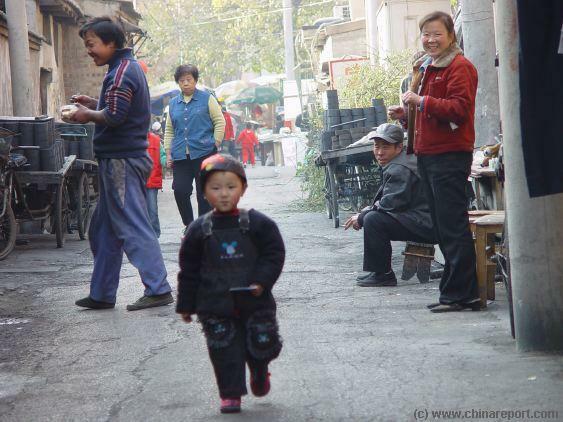 A look through the easternmost sections of the then still lengthy Qianmen East Alley. 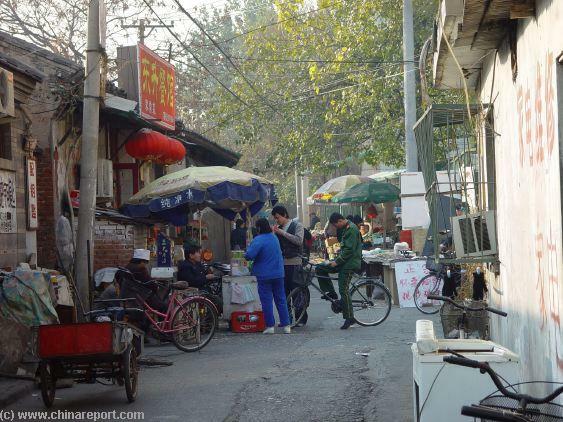 It was not a Hutong extra-ordinary beauty but rather a back road between the newly built 1960's and 70's era flats along Qianmen East Boulevard and the actual Hutong, which extended for kilometers to the east, south and west. 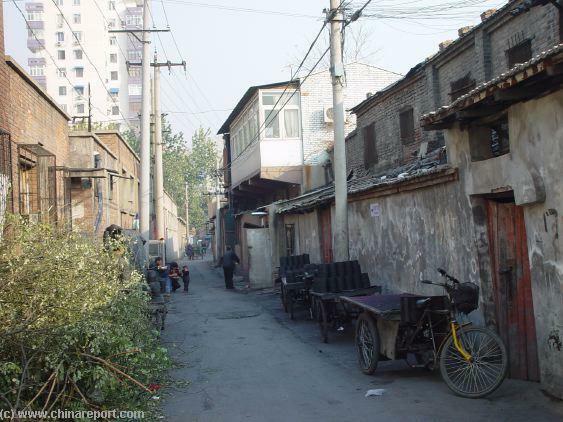 Today most of these hutong have been destroyed and replaced by modern highrise appartment blocks filled with newly affluent Chinese often not native to the original hutong. 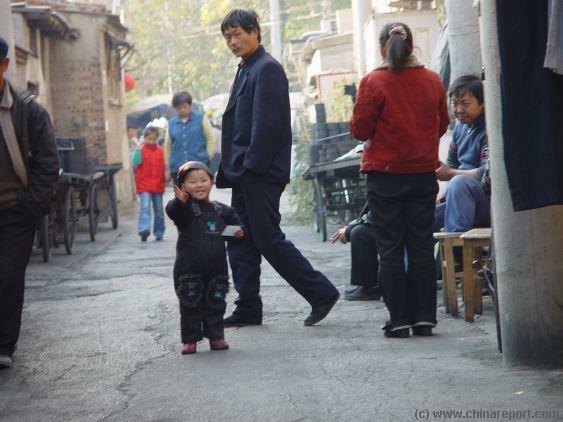 A happy little boy playing in Qianmen East Alley enthusiastically greets the passing foreigner. Safe and in his element he freely darts around, albeit under the constant supervision of family and neighbors. 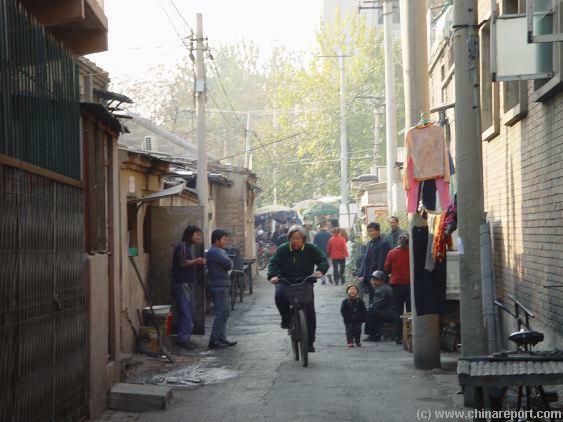 Such used to be the life in the Hutong of QianMen in Beijing. AsiaReport.com generated Google Map Overview of the location of Qianmen East Alley lying parallel to Qianmen East Boulverad in the Chongwen District of Beijing. 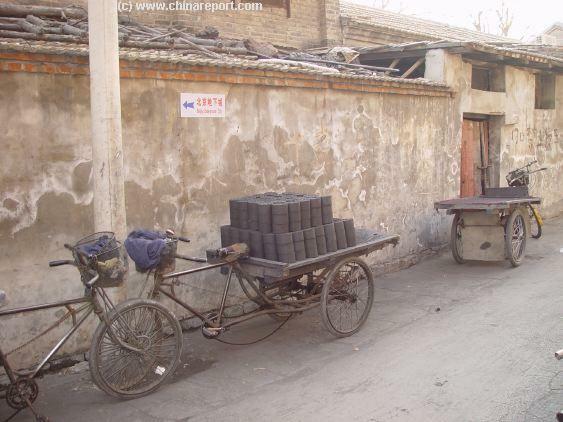 Today almost a thing of the past, tricycles loaded with pressed coal bricks line the hutong alley awaiting delivery to the countless households of the surrounding hutong. 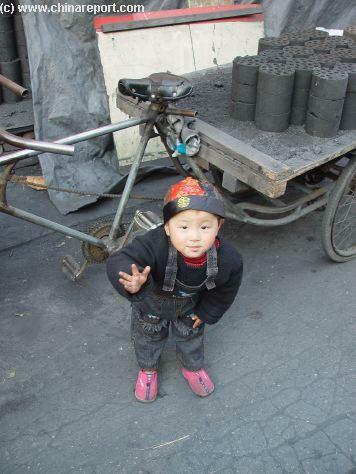 Today the use of coal bricks or pellets for heating and cooking is greatly discouraged, sanctioned away as old fashioned and unhealthy due to the excessive and toxic pollution produced when the coal is burned. This is one of the sights that will be missed along Qianmen East Alley and the surviving neighboring alley's such as West Damochang Alley (Underground City Lane) and but a few others.